For other uses, see Giorgio Armani (disambiguation). 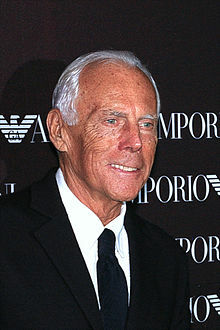 Giorgio Armani (born 11 July 1934) is an Italian fashion designer. He was born in Piacenza, Emilia-Romagna. He is famous for designing men's clothes. He made his company, Armani, in 1974, and in 2001 was said to be the most successful designer to come from Italy, with a yearly turnover of $1.691 billion, and having $4.1 billion. Armani is openly bisexual. ↑ "Giorgio Armani, The World's Richest People - Forbes.com". www.forbes.com.